Super duper squishy fun!! Check out 16 of the most unique and easiest uncooked playdough recipes online. Combine all ingredients together in a bowl. Knead it until it forms a ball. Add more water if too dry or more flour if it’s too wet. The children in my preschool love this dough, it combines sand table play and clay, they never want to put it away. Good for children that are very tactile. 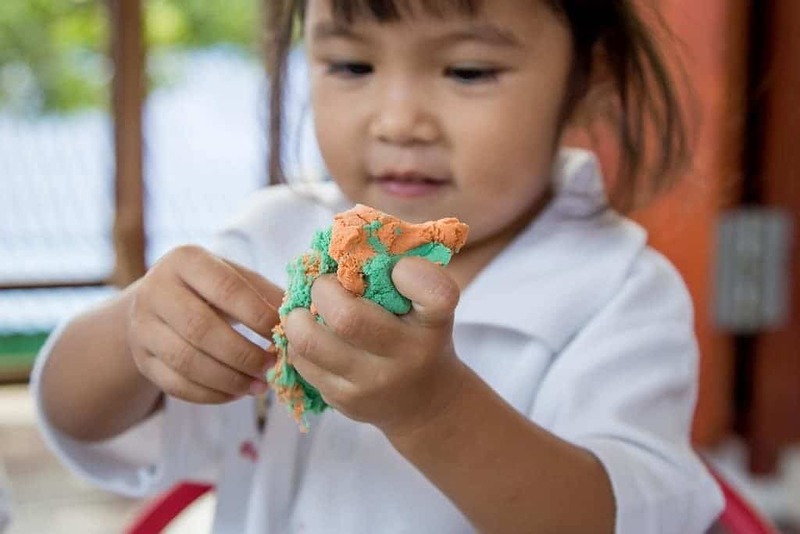 Make really fun and natural “play” “clay” by using oatmeal, flour, and water!! 2 parts oatmeal, one part each of water and flour. Knead until soft. It smells good, feels good and stays soft longer!! It is also very cheap!! Enjoy!! There are no real measurements for this recipe. Just experiment! Let the kids help you. This is a great science experiment. Start adding the school glue bit by bit until the mixture becomes doughy and non-sticky. Knead the dough until it’s pliable and fun! Mix everything together. Knead the dough until it is pliable and is not sticky. Have the children use cookie cutters to create ornaments. An adult will bake the ornaments at 300 degrees for a half hour. Check the ornaments, if they are not hard enough, bake for another 15 minutes. These ornaments smell GREAT even after they have been baked. Here’s yet another kool-aid variation my students ( and my own big kids at home) love. Try using it while still warm too. Adults: Mix dry ingredients well. Add oil and water. Stir quickly, mixing well. Knead with hands when cool enough to handle. Store in air-tight containers. Mine has lasted as long as 3 weeks before the smell and soft texture has gone. Have fun! 1. Mix all the dry ingredients in your bowl. 2. Add the oil into the water then mix into the dry ingredients. 3. Stir until the dough forms a ball (add more flour if the mixture is too sticky, add more water if the mixture is too dry). 4. Knead on a lightly floured surface until the dough is pliable. 5. Refrigerate in a zip lock bag when not in use. 2. Add the oil and food coloring into the water then mix into the dry ingredients. This is a great idea to use with pre-schoolers and early elementary age children. There are no specified amounts that I have used. Place at least a cup of applesauce into a bowl and then begin to add cinnamon until you have a dough mixture. It takes quite a bit of cinnamon. The dough will be soft and easy to form into shapes. It also smells great. Allow the children to make shapes using their hands or cookie cutters and then set aside to dry. If you leave them out to the air it could take up to a week for the dough to completely dry. I often place them in the oven on low for a couple of hours after a day or so and that will help the dough dry faster. These make great holiday gifts. Mix ingredients. This in NOT edible. Keep this one refrigerated otherwise you will have another science experiment. Mix equal parts of Peanut Butter and Carnation Non-Dairy Creamer in a bowl w/spoon. Finish mixing by kneading the dough. Fun……and tasty too! Mix all the dry ingredients together. In a separate bowl, mix the soap, tempera, and water. Add the water to the dry mixture. Knead until pliable. Mix flour, cornstarch, and glue. Slowly add just enough water to make a dough. Knead until soft and pliable. Mix flour and water together until you get a smooth paste. Dip the cotton balls into the paste. Form into desired shapes. Place on cookie sheet and cook at 325 for 1 hour until lightly brown and hard. Let cool. Paint creations with tempera paint. Combine dry ingredients. Add water a little at a time, and stir into flour. Knead until smooth. Use any of the recipes above but add a small amount of lavender essential oil!